When email marketing arrived on the scene, experts and entrepreneurs alike heralded it as the death knell for direct marketing. You remember all those hyperbolic letters that would appear unsolicited in your mailbox and had an alarming penchant for proclaiming their sales points in all caps? That was direct marketing, and people really thought that emails would replace it. Why? Well, they cited as evidence the fact that email is cheaper to send, gets to potential consumers quickly, and encourages more succinct and effective marketing messages due to the brevity of the medium. Of course, we all know what email marketing largely turned into—hyperbolic letters that appeared unsolicited in your inbox and had an alarming penchant to proclaim sales points in all caps. In fact, some people (the author of this post included) started creating throwaway email addresses so their main accounts wouldn’t become overwhelmed with such spam. Now leap forward to the second decade of the 21st century, and what are experts trumpeting as the next channel to ascend to email marketing’s throne? SMS marketing. This time, though, they very well might be right. Back in 2014, people started to realize that email itself was becoming more of a mobile phenomenon than simply something bound to a desktop computer. That year’s Internet Trends’ report found that mobile usage comprised a quarter of all Web traffic, and guess how companies with revenues in excess of $100 million began to prepare the mobile revolution: They started loading up on SMS marketing capacity. Indeed, a Harris poll found that a whopping 89 percent intended to include an SMS text plan in their marketing mix. It’s not hard to see why, particularly when compared to email. Email-screening company SaneBox has found that most people spend 28 percent of their work weeks dealing with the electronic missives. That statistic becomes even more significant when you consider that users find 62 percent of such emails utterly irrelevant and that the number of emails sent daily will likely soar to 246 billion—yes, with a “b”—by the year end of 2019. 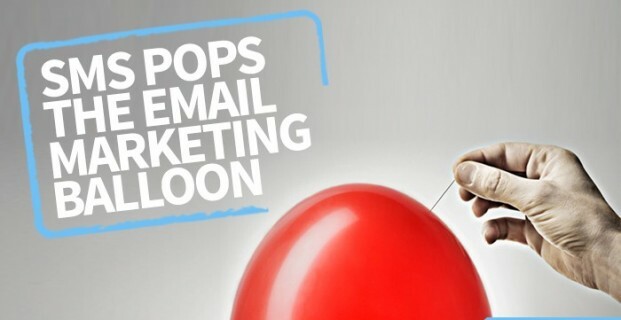 Suddenly the email-marketing opportunity seems more like a big, fat balloon waiting for a pin to pop it. That pin could very well be SMS marketing. Not only does the world contain 4.75 billion mobile phone subscribers [links to PDF], they’re increasingly using their phones for a manifold number of tasks—as are businesses. For one thing, SMS messaging lets companies know they’re dealing with real people rather than bots. It helps businesses connect with customers on the fly when they’re ready to buy. It adds extra security via two-step authorization and provides instant updates for time-sensitive matters. SMS can often turn customer support, always a difficult proposition, into something more manageable for both parties. And the best part? SMS marketing is a maturing field that still offers plenty of upsides for businesses. So forget about building your products off of emails and inboxes. Spamming is so 20th century.